Even with MFG Day 2017 efforts, there is much work to be done to fill the MFG skills gap. There is good news for the manufacturing industry. Last night, the Senate passed a Tax Reform that the National Association of Manufacturing (NAM) says is a “critical step forward” for US manufacturers. This is great, considering NAM also reported that 57% of manufacturers will increase wages, 64% will expand their businesses, and 57% will hire more workers if the tax reform was voted into place. Check out the rest of this story! Aside from this news, MFG Day 2017 recently took place. 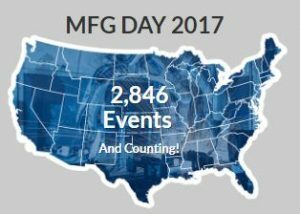 With the actual holiday celebrated on October 6th, but many events still taking place throughout October, MFGDay.com last clocked in at over 2,800 events registered. With the younger generation being more exposed to manufacturing careers and more budgets on the horizon for the manufacturing industry, these could be the two key ingredients to filling the MFG skills gap. She conveys that the problem is not a job shortage, but an industry that can’t meet the demand with sorely needed technical skills. Paying someone to learn on the job could be a great solution, with Margo saying “if agencies focused on developing one working apprentice for every four college students, it would equal five million new tradespeople in the workforce.” For MFG Day 2017, Power Minds worked with Saddleback College to help promote the school’s Innovation and Entrepreneur Centers, and they continue to both develop and promote apprentice programs. Use Military Veterans: We recently spoke to Hernan Luis Y Prado at Workshops for Warriors (WFW), which is an organization that helps military veterans gain education towards manufacturing careers. “What sets WFW apart from any other Veteran educational organization in the nation are the Nationally-recognized portable and stackable credentials our graduates have the opportunity to earn,” Hernán said, who served in the Navy for 15 years. “These credentials are our graduates’ passport to financial freedom, anywhere in the world, for life.” The school will be able to use the GI Bill in Winter of 2018. Use “Edutainment”: Jeremy Bout, the founder of Edge Factor, thrives on storytelling. With his online network of documentary-style videos, live events, and more, edutainment (AKA entertainment media with an educational aspect) is a great way to reach developing minds. With videos that have the potential to go viral and be enjoyed by many, Jeremy’s Edge Factor is a terrific idea. This also stands true for popular YouTube accounts, such as Titans of CNC, NYC CNC and John Grimsmo’s machining channel. Considering YouTube has over 1 Billion users, this is also a great avenue to pull in youth interest. 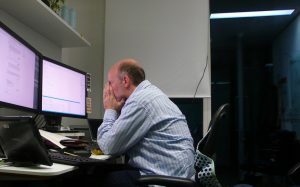 With your shop floor’s workforce potentially expanding soon, are you ready to help your new operators combat downtime? Call (877) 611-5825 or fill out a contact form to ask us about solutions for better OEE!